Saying goodbye to a loved one is difficult, I know I lost my mother more than 3 years ago. So, writing a last testimony to commemorate an amazing life can be challenging during the stages of grief and bereavement. However, with this heartfelt and memorable eulogy example it will help you through this daunting and overwhelming time. This example is a personal tribute to honour my mother Josephine Jean. Although I knew my mum was terminally ill, it was still painful to let her go. Cared for safely and comfortably in a palliative care home in London, she gained her angel wings on 26th September 2015. Debilitating effects of vascular dementia took my sweet mum from me. And it was hard to come to terms with the fact that my best friend, partner in crime and her feisty personality was no longer part of my life. I miss her physical presence dearly. Good afternoon and welcome everyone. On behalf of all the family I would like to thank you all for being here today, and for your kind words, flowers and sincere support. 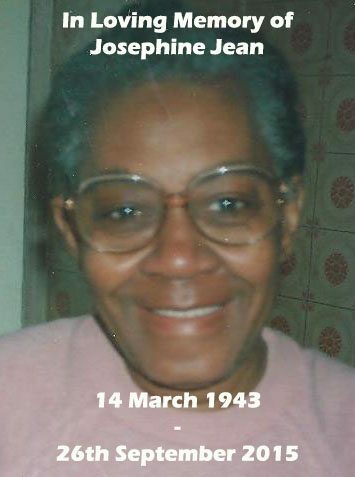 My mum Josephine Victoria Wade Jean, born in Kingston, Jamaica on 14th March 1943, fell asleep peacefully on Saturday 26th September 2015. The lord giveth and the lord taketh away, blessed be the name of the lord. Today we will say a last, fond farewell to our much loved and cherished, mother, grandmother, great grandmother, sister and friend. Let’s celebrate today, Josephine’s 72 years of life, in a way she would have loved. We hope we can provide some comfort to those of you most affected by her passing. I know it will be with heavy hearts that you have travelled here, to pay your last respects. It shows how much you cared for her and how much you loved our mother, Josephine. Unfortunately, some family and friends could not make it today. However, I’m sure they will be thinking of us all at this sad, challenging and difficult time. You may find it strange to contemplate celebration when many of us will still be grieving, crying and struggling to come to terms with the pain of our loss. Taken from us to soon was a valuable life, and that raises a lot of questions. The feelings of loss, memories and emotions become stronger. Mostly, it is the sense of unfairness, because a highly spirited, fun-loving, unique person is no longer with us. Shortened by the debilitating effects of vascular dementia her beautiful life came to an end. Josephine had a brave, courageous heart. She also had a strong, feisty and imposing will to survive despite her other ailments such as diabetes, deafness and speech impediment. Even when mummy’s physical movement and speech failed her, she was still able to react and communicate her wishes and feelings, towards the end of her earthly life. Who was Josephine Jean? Well, she was an amazingly beautiful woman with a great sense of humor. Mum was well-informed about current affairs as she liked to watch BBC & ITV news. And she loved to watch East Enders, Coronation Street and Emmerdale Farm. They were her favorite past times because she could have full charge of the remote control. Her dress sense was impeccable, too. She loved to wear dresses, bright colourful ones, preferably in combination with gorgeous prints or floral patterns. She had a sweet tooth! Every day she enjoyed a special treat, such as a piece of Jamaican bun with a cup of tea. Josephine was an ace at cooking rice and peas. Her fried fish and chicken was mighty tasty too. She loved to read, hum and sing church hymns. You also couldn’t stop her from going on her regular shopping trip to North End Road Market, in Fulham, either. In time, I hope we can accept, and embrace the fragility of this life and learn to make the most of it among those we love, care for and live with… just like Josephine. Where there are no days, weeks or years. Forever loved so very much. I sincerely hope this poem will give us all comfort. Mum, is now flying with the angels but she’ll always be a part of us. Each one of us played an important role in her life. And like threads woven into the fabric of her life, we are all a beautiful tapestry full of wonderful, incredible and vibrant colours. Married to my father Julian Jean for more than 30 years, Josephine was a caring and loving wife. He, has sadly passed away, too. Her legacy is 4 children; 3 grandchildren and a great grandchild. As time passes she will remain secure, alive and safe in our hearts, our laughter, and our smile and we can reminisce and reflect on the special relationship we had with her. The greatest testimony to Josephine Victoria Wade Jean’s memory is to make the most of our lives, and live every precious day as if it were our last. This will bring us all healing in time. Rest in peace, dearest mum, and God bless your bright, loving and beautiful soul. Please leave your thoughts in the comment box below. I’d appreciate if you could like my https://www.facebook.com/Britishcelebrant and share this article.